This care-sheet is a general guide to the captive care of North American box turtles in the genus Terrapene. Box turtles are generally hardy animals that can thrive in captivity when properly cared for. They often have distinctive personalities and can learn to respond to their keepers. They are also very long-lived animals. It is possible for you and your box turtle to have a long and happy relationship together if you provide a suitable environment and proper care. Eastern box turtle (Terrapene carolina carolina) dining on snails. Box turtles have a hinged plastron (under-shell) which allows them to close up tightly inside their shells. A healthy box turtle will have a good weight, and will react when picked up either by struggling to escape or by hastily withdrawing into its shell. A newly acquired box turtle should be closely monitored for signs of illness and given time to adjust to its new surroundings. This is especially true of box turtles obtained from pet stores. These are often ill and may suffer from heavy infestations with internal parasites. To prevent the outbreak and spread of infections, newly acquired box turtles should be quarantined for at least 3 months before being introduced to others. Ideally, box turtles should be kept outdoors in a backyard or in a purpose-built enclosure. Fencing around the yard or enclosure must be secure enough to protect the turtle from dogs and other potential predators. Box turtles can dig under or climb over fences. Adding a lip along the top of the fence and trimming plants and vegetation growing alongside will reduce the risk of your turtle climbing up the fence and escaping. If raccoons and skunks occur in the neighborhood the enclosures must be covered. Plant the enclosure with small shrubs to provide shade, and with edible plants such as strawberries. Provide moist leaf piles, compost heaps and rotten logs for the turtle to hide, sleep and hunt in. During the summer, box turtles are most active in the early morning and late afternoon, and after rain. In dry areas the enclosure should be sprinkled with water daily to maintain adequate humidity. A dish of water large enough for the turtle to soak in must be available AT ALL TIMES. If kept indoors, a warm (75° F, 24° C), moist, roomy terrarium should be provided. It must be furnished with a dish of water for drinking and soaking and a hide box or shelter. Potting soil (screened for glass, plastic and other contaminants), newspaper or indoor/outdoor carpeting can be used for the terrarium floor, but it must be kept clean. Corncob bedding and wood shavings are dangerous and should be avoided. The terrarium should be misted daily to maintain the humidity. Box turtles will often defecate in water and so their water bowl should be cleaned daily. 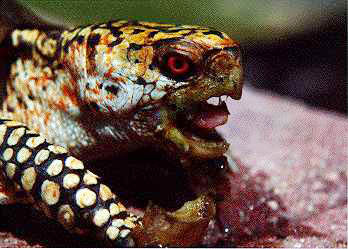 Box turtles housed indoors should be allowed outside in natural sunlight when possible and allowed to exercise frequently. To augment natural sunlight indoors, a full-spectrum fluorescent lamp such as a Vitalite®, Sylvania 50 or Chroma 50 light should be placed over the terrarium. Box turtles tend to like early morning feedings. They are omnivorous in the wild, and eat a substantial amount of insects and other invertebrates as well as fruit and some vegetable matter. They should be offered animal matter (night crawlers, snails, slugs, worms, crickets, Purina trout chow or low fat cat food) at least twice a week. They enjoy fruits such as tomatoes, apples, cantaloupe, strawberries, and blackberries. Some box turtles will take greens, leafy weeds, grape leaves and mixed vegetables. Sprinkle the food with a calcium source such as calcium carbonate or calcium lactate once a week, and with a vitamin preparation such as Superpreen® or Reptovite® once a month. Snails are a particularly nutritious food favored by most box turtles. However, you must not offer snails that may have come from an area where snail bait has been spread. If in doubt, purge the snails by maintaining them for one week on a diet of romaine lettuce or weeds from your yard before feeding them to your turtle. NEVER use snail bait or other pesticides in or near areas where box turtles are kept. Generally male box turtles have longer tails than females, and depending upon the particular species, may have a concave plastron and bright red eyes. Captive box turtles may mate at almost any time of year, although courtship peaks during the spring and fall. 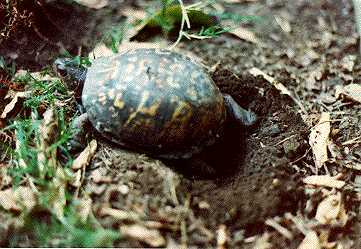 Box turtles usually nest between the months of April and July. Nests are often dug at night. The female will lay 3-8 elliptical eggs, about 1 1/2 inches long, into the 3-4 inch deep flask-shaped cavity. Some females lay multiple clutches of eggs spaced at 3-4 week intervals. Box turtle eggs can incubate successfully if left in the ground, but precautions may be needed to protect them from extreme climatic conditions and predators. Eastern box turtle excavating a nest in her outdoor enclosure. Many hobbyists enjoy incubating their turtle's eggs artificially. When the female has finished laying, open the nest and carefully remove the eggs. A clean paintbrush is a useful tool for uncovering the eggs. Box turtle eggs can be successfully incubated in a variety of ways, but a few basic rules should be followed: (1) do not shake, rotate, or turn the eggs; (2) keep the temperature at about 80° F (27° C); (3) maintain the humidity at about 80%. These conditions can be met by placing the eggs on a suitable substrate (moistened vermiculite, sphagnum moss, and damp paper towels have all been used with success) inside a suitable container (plastic shoeboxes or plastic margarine tubs are commonly used, with the lids kept on to help maintain the humidity). The container is placed in an incubator or in a location that remains slightly above room temperature such as a cupboard on top of a refrigerator or above a water heater. The eggs are checked regularly to make sure that the substrate remains damp. The eggs should hatch in 50-90 days. If you need more information on incubation please contact the Club. It may take several days from "pipping" (the time when a hatchling first breaks through the shell) to the actual emergence of a box turtle from its egg. It is usually best to leave the hatchling alone as it tries to free itself from the egg other than gently spraying the eggs with tepid water to prevent dehydration and reduce the risk of egg-shell adhering to the hatchling. Once the turtle has hatched, you may notice a yolk sac attached to the underside. It is important that this sac is not ruptured so hatchlings should be left in their incubation containers for a day or two until the yolk sac is absorbed. Once the egg sac is absorbed the turtles can be moved to a suitable terrarium. Some keepers provide an indoor set-up similar to that described above for the adults using a substrate of potting soil. However, because hatchlings are susceptible to dehydration many keepers house their hatchling box turtles in a more aquatic environment. A common set-up consists of a plastic sweater box that contains about one half inch of water in which are placed "islands" of wood, rock, or sphagnum moss that the hatchlings can easily climb out on. Alternatively the shoebox can be tilted so that one end contains water and the other end is dry. A small plastic planter cut in half can be added to provide a hide box. The water must be changed daily. Hatchling box turtles are very shy and may not eat until they are several weeks old. Offer the food in a place where the hatchling will feel secure while eating. Some hatchlings will take Purina trout chow or cat food immediately. The best food to offer hatchlings that are reluctant eaters is live food such as small worms, slugs, or sow bugs. Over a few days, introduce other foods such as Purina trout chow, cat food and small pieces of fruit. Placing whatever the turtle is already eating on a new food item will increase the likelihood of getting them to eat it. 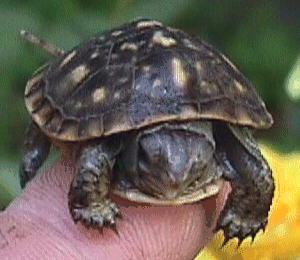 Hatchling and young box turtles should be kept away from adult turtles and other pets. If kept outside they should have their own enclosure where they are protected from predatory animals and birds. You must provide places for them to hide and a dish of water dish, large enough for them to soak in. Soaking stimulates a box turtles appetite and helps with elimination.